This July, FoodCoin was featured in several media resources. Swiss cheese producers are collaborating with FoodCoin to use blockchain in their business. One of the manufacturers, Sennereigenossenschaft Obergedteln, owned by Mr. Hubi Jost and dairyman Dietmar Benedetti, are located in canton Wallis in Switzerland. FoodCoin had a talk with Dietmar Benedetti about their business and farming in Switzerland. 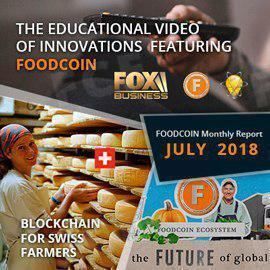 FoodCoin Ecosystem promotional video prepared in collaboration with Innovations TV has been launched in July 28, 2018 on FOX Business channel: youtu.be/0MoeiQbcKFg. Other promotional video blocks are planned for launching this autumn in Japan, China, US and UK. You can see data type in Var Name string and value - in Value field. Photos, privacy settings, and explicit content hiding feature will be available later. Due to the General Data Protection Regulation (GDPR) recently enacted in Europe, which prescribes providing possibilities to modify, remove and restrict the access to the personal data, we cannot store the data directly in the blockchain, as one of the features of blockchain is consistency and transparency of the information. This is why we developed a hash system. Hashes are electronic signatures generated on metadata insertion and stored in blockchain. The metadata stored on a server instead of blockchain, and it can be modified. However, on each modification a new hash is generated. Thus, to verify validity of the information, only the coincidence of hash must be checked. There is no need in manual verification, because it is done by the system. If the hashes do not coincide, then the information will be marked as invalid. This system is as safe as if it was stored in the blockchain. In addition, centralized data and decentralized hash storage does not allow impersonation or compromise. Access rights can be adjusted in accordance to the law. An important feature of the information is the confirmation from the verifier, which also changes when hash is changed. If the signatures coincide, then they are trustworthy. The information about a particular person or company is displayed on the Owner page. It can be the balance, metadata, or ProRids. ProRid is history of a product or a service stored in blockchain. It is submitted by owner of the good - a verified person ot company. It allows checking the history and origin of a good. Now, ProRid includes only text information: owner's name and its relations with other other ProRids. At later stages, it will allow attaching photos and files, as well as different types of fields for information. To add a custom token, you have to insert its name and contract address to the special fields. Adjusting GAS, network average automatically. Put more GAS for faster transactions. Further, Wallok is going to support multiple accounts; it allows sending transactions through Guarantors or without them. Individual accounts for transactions with Guarantors are necessary for Guarantors' safety. The wallet will be available for public testing during August. We are preparing new features now. We believe these instruments will be helpful and convenient for our users. Stay tuned to the news!